Came reeling out of the Centre de Pomdiou, my head full of great art, into La Place Beauborg to be meet with some beautiful spanish feeling ….. duendé… sotto, low & subtle. Fine. 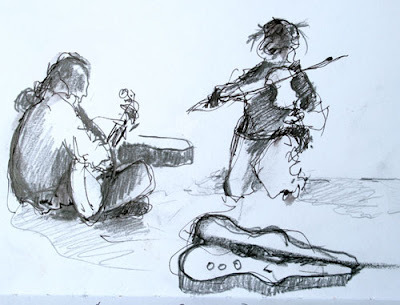 The violinist was a Romany from somewhere near India, at a guess, & he had a crazy hair-do. 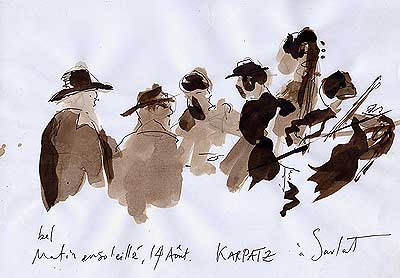 The guitarist had a southern European/Romany air; he picked, strummed & accompanied very well, a bit like Paco de Lucia.I only had one hour in the Pompidou & had to get back to the gallery, pick up bag & get quickly to Montparnasse for my train, leaving to go back home to the South West.Drawing ‘sur la vif’ for the brief duration of a song. The time of a song. Le temps d’une chanson. Never to be repeated. Never to pass again. I love a gypsy lilt to the violin. Makes me think of Yehudi Menuhin playing Bach’s Double Violin Concerto. The guitarist called the Duendé, the accords in duo were struck, the lilt danced for a perfect moment & then the event came to an end. I left to catch my train, not forgetting to throw some coins in the hat (music case). I have an award waiting for you over on my site if you’d like to come over.